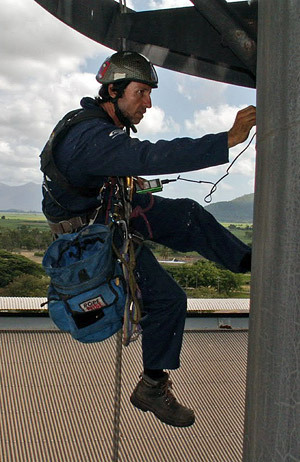 Rope access inspection work is generally light duty and only requires a relatively short duration at a location. It can also require that most if not all parts of a structure or building are accessed. This is why traditionally scaffold costs are the major item in any inspection programme. For this reason rope access has revolutionised the delivery of inspection programmes; an inspector using rope access techniques can access an area and conduct the inspection in a fraction of the time required using traditional access methods. This means that inspection budgets can be spent on inspection rather than the access. The quicker turnaround also provides increased flexibility for engineers doing ad hoc inspection work, and the shorter duration required to complete tasks provides statistically improved safety performance due to less hours of exposure to height and any other site specific hazards. High Q provide inspection and structural surveys to a wide range of clients. The inspection may be a stock condition inspection, used to ascertain the general condition of a building or structure and to highlight any potential or existing problems; a point of problem inspection which concentrates on a particular existing problem or a baseline inspection to establish the build standard of a particular structure in great detail, providing data against which future checks can be made. High Q have experience inspecting a wide range of materials and structures; from steel to concrete, chimneys to buildings, and have inspectors qualified by PCN, ASNT & AINDT in non-destructive testing methods.